Josh Bernoff, co-author of Groundswell, posted this table from his book. 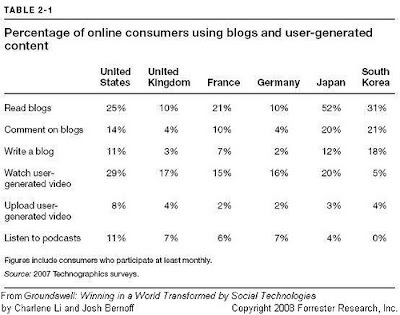 Over half of online users in Japan read blogs - compared to just 10% in the UK. Interesting to see the ratio of reading blogs to commenting on them or writing them. Is it odd that 18% of online consumers in South Korea write a blog while only 5% watch User Generated videos? More info here. Wonder what Ireland stats are? Amarach did some surveys last year on this. According to Amarach 17% of Irish Internet users surveyed claimed to be writing their own blog. Comreg's did a survey in 2006, results indicated that 14% of users surveyed claimed to be writing a blog, and that 22% of Irish Internet users regularly read blogs. thanks Sinead. I'm surprised. That's very high. Surprised? Me too. Especially considering the actual irish blogosphere is only about 3,000 or 4,000 strong.